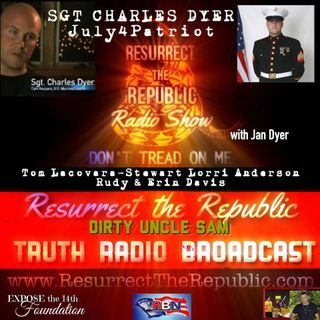 ( http://YearOfJubile.com ) and Tom Lacovara-Stewart interview Sgt. Charles Dyer’s mother Mrs. Jan Dyer. Mrs. ... See More Dyer will go into detail on her son and marine Charles who was was setup by his former wife while in the middle of a savage custody battle over their precious daughter. In 2010, Charles was a rising political star in the tea party and had the military credentials to backup his non-compromising stand against tyranny. About a year earlier, J4P was found not guilty by a jury on trumped up weapons charges. In 2009, J4P created videos considered to be "anti government." On youtube his followers reached well over a million, in a few short months. The establishment needed to silence Charles and they found a weakness in his marriage. For those that have taken the time to read and investigate the evidence, it is apparent that Charles is innocent and exculpatory evidence was withheld from the jury. His conviction was on pure hearsay evidence. It took three trials to finally convict Charles who did not get to present his full defense before the jury in the third trial. Please educate yourself about Charles' case and write to him in prison. As of 2018, Charles has served over 8 years on a 30 year sentence as an innocent man. Charles needs our help and support. Do not abandon this man in his time of need.